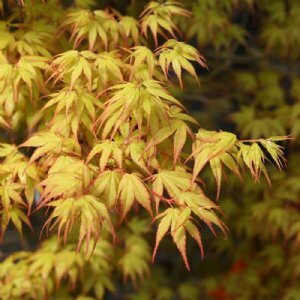 Acer plants, also known as Japanese Maples, are sought after for their incredible autumn color. These small, deciduous trees are slow growing and compact, which make them perfect for containers and small spaces. Small size with BIG color. This diminutive tree emerges in bronze tinged with red, matures to lime green, then blazes bright orange and red as a grand fall finale.